Last weekend, the Japanese Fisheries Agency officially notified the International Whaling Commission that its whaling fleet plans to return to the waters of Antarctica to hunt 333 Antarctic minke whales over the next four months. This despite the fact that on March 31 2014, the International Court of Justice declared Japan’s whaling program to be illegal, and ordered that it immediately cease. Much of the difficult and dangerous task of battling such illegal activity has been helmed by Sea Shepherd, an anti-poaching organization that has been shepherding international waters for years. Its activities have also been highlighted in Animal Planet’s Emmy-nominated reality program, Whale Wars. This news prompts us to highlight a related DTBF story, “Love Made Visible: My Adventurous Year” by Jo-Anne McArthur. 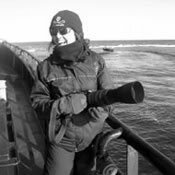 McArthur is an international photojournalist and animal rights activist and this story is about one year in her life when, amongst other things, she volunteered as a staff photographer aboard a Sea Shepherd vessel called the Bob Barker, witnessing and photographing direct encounters with Japanese whaling ships that were poaching illegally in international waters. Life won’t always be this idyllic aboard our boat, which the crew affectionately refers to as “The Bob.” We will have intensely dangerous confrontations with our rivals, the Japanese whaling fleet. Our boat is one of three on this 2009-2010 Antarctic Mission to stop the poaching of up to 935 Minke whales, which are hunted by the fleet and sold for meat in Japan. Dare to be Fabulous will be featuring more new stories in the coming months. Consider sharing a DTBF story of your own! Submissions are open and stories are also welcomed in audio or video formats. Please check the submission guidelines for more information.